HD Mining, the company that was granted permits to bring 201 temporary foreign workers to Canada, fell short in looking for qualified local personnel before bringing in Chinese miners for its coal project in British Columbia, said the province’s Jobs Minister Pat Bell. In an interview with CKNW Radio, Bell added the Temporary Foreign Worker Program needed to be fixed. "There is no question people are angry and I accept that, we accept that. I think that is why when [the Minister of Human Resources and Skills Development] steps up and says we are going to do a review of the program, we agree with that. I am clearly on record saying that I think it is appropriate, because when people lose confidence in a process like the Federal Government have with the temporary foreign workers, you need to revisit that and make sure that is regained," he added. Last month HD Mining was forced by a court to release the resumes of rejected Canadian workers. Two B.C. locals unions – the International Union of Operating Engineers and the Construction and Specialized Workers Union – have been trying to get HD Mining’s foreign workers’ permits cancelled. The unions maintain HD, a B.C. company backed by Chinese interests, could have hired Canadians and that it advertised positions at less-than-going rates. The miner, however, has insisted it was not able to hire locals with the required skills for its operation and that it advertised positions at competitive wages. 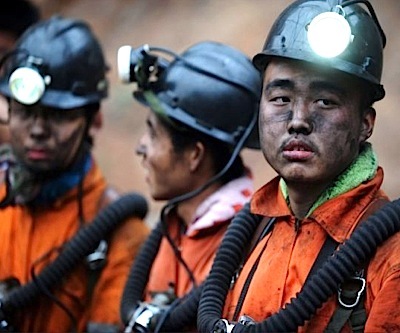 Canada looks into the hiring of Chinese miners in B.C.